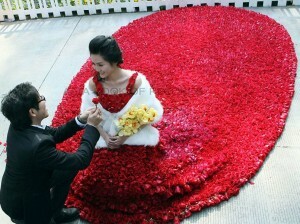 Yin Mi, a woman from China, was dressed in a rose bridal gown made out of 9,999 red roses, on February 14, 2012. The gown was made by her boyfriend Xiao Fan to propose to her at the Guangzhou Chime-Long Paradise where they first met each other three years ago. Comments for ROSES AND PETALS are now closed.